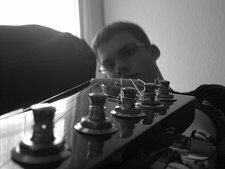 I've been playing Bass since I was 7 years old and started playing electric guitar when i was 9, I play at least 2 hours a day and I love music to the bitter end. I perfer rock music or blues, but honestly I can cope and play with any kind of music! Thanks for stopping by, shoot me a text (250-858-1220) if you'd like to jam! Thanks.